Matthew Boid was driving to a doctor’s appointment when he saw the flames in his rearview mirror. Ray Miller was bringing his car to the shop when he saw the entire canyon ablaze. Bobbie Crippen heard the explosions of propane tanks grow louder as she drove four family members and two dogs through the fire to safety. All three of them felt the heat from the flames as they fled the fury of the Camp Fire in Butte County on the morning of Nov. 8. Every person I spoke to at fire evacuation centers in Chico had a similar story to tell. Crippen recalled the evacuation phone call she received that morning. “They said, ‘Get out, get out now.’ And [when] we got out, the fire was behind our house,” Crippen told me, recounting Thursday’s events. She and her grandsons got into the car and drove three houses up the street, where they saw the neighboring field was on fire. With flames on each side of the road, they proceeded safely into Chico. Other evacuees were forced to escape on foot through the area’s limited exits and mounting traffic. The Camp Fire sparked near Camp Creek early last Thursday and decimated 138,000 acres of rural Northern California at time of press. 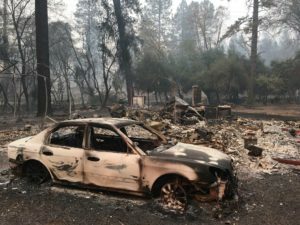 It brought the town of Paradise to the ground and destroyed 8,756 residences at the latest count, according to Cal Fire. In addition to the homes, 260 businesses, at least one elementary school and parts of Feather River Hospital are gone. In a press conference on Nov. 14, Butte County Sheriff Kory Honea announced fatalities reached 56. This is the deadliest wildland fire in California’s history. Numbers of death and damage continue to trickle in as crews search the debris. Remains they’ve found are thoroughly burned, making the identification process for the bodies lengthy, and in some cases impossible. By Monday, the Butte County Sheriff’s Office received about 1,500 calls regarding missing persons — 200 individuals have been found but at least 130 others are still missing at time of press. 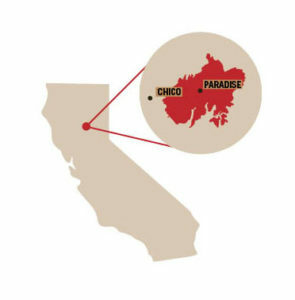 Currently, scores of Paradise residents sit in makeshift evacuation centers assembled in Chico. Some told me they’re certain their houses are destroyed, others aren’t so sure. For now it’s a waiting game. Debris lies where houses once stood in a Paradise neighborhood. Many Paradise residents will return to scorched scenes like this one. Photo courtesy of Bill Husa. 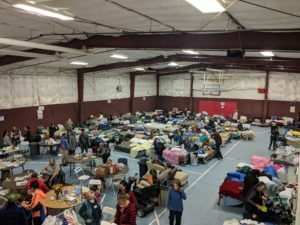 On the morning of Nov. 12 about a dozen evacuees posed urgent pleas to a Cal Fire official at the Red Cross shelter in the Bidwell Junior High School gym. When he couldn’t provide answers, the group grew tense and irritated. It’s almost impossible to begin to recover when residents don’t know exactly what, or who, is gone. In limbo, individuals across Butte County are coming together to provide immediate help. In a 10-minute drive down East Avenue, one of the main streets in Chico, I passed four evacuation and donation centers. When one church-turned-evacuation-center fills, another opens. Stacks of supplies formed walls outside of entryways and bins overflowed with donated clothing yet to be sorted. Fire survivors rest on cots and air mattresses in the makeshift shelter of the East Avenue Church gym while volunteers sort donations and offer help. Photo by Laretta Johnson. A haze hung over my hometown, painting the sun red. The streets felt empty and apocalyptic. I discovered the population — and the community— in each center. Dozens of volunteers buzzed between rows of displaced people, checking in, gathering their laundry and serving them food. In Chico, everybody knows somebody who lost everything. Trauma varies for each person, but the fire’s impact extends past the 52,000 evacuees. As I walked through rows of cots in school gyms and church halls, many of those most impacted were optimistic. Crippen’s attitude was mirrored in the shelters, a testament to my community’s resilience. People are devastated and lives altered, but those who came away with their families are, more than anything else, thankful. Boid isn’t alone. Many in Paradise and the surrounding affected areas didn’t come from much. The poverty rate in Paradise hovers around 14 percent, but jumps to 18 percent in neighboring Concow. Insurance rates are high because of the terrain’s susceptibility to fires, and many properties are underinsured. Before the fire Paradise was quiet and secluded — its residents’ struggles rarely documented. Its precarious status and overwhelming damage make reconstruction a question of not just when and how, but if. 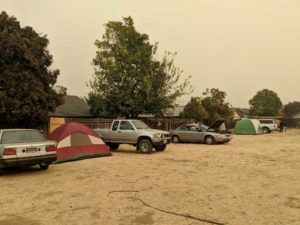 The Camp Fire is now 35 percent contained, and as the crisis begins to subside community members are wondering what the next steps are. The evacuation centers in the area currently shelter 1,385 of 52,000 evacuees. County officials suspect others are staying with friends or family, but cots, couches and cars are only a temporary solution. Evacuees camped in tents and cars in the lot behind the East Avenue Church shelter in Chico. Some stuffed extra blankets and clothings around car windows in an attempt to keep smoky air from seeping in. Photo by Laretta Johnson. Ken MacKell, a program manager for the county’s employment services, worked overtime every day since the fire began to help coordinate evacuation centers and supplies. He will now help lead a housing task force established by the county. MacKell said the task force will consider mid-term shelters as well as long-term housing solutions. Among the possible mid-term solutions are emergency trailers. President Donald Trump declared the fire a national emergency and aid efforts from Federal Emergency Management Agency (FEMA) arrived today. Trailers are often part of FEMA aid, but Congressman Doug LaMalfa said he is unsure of where those trailers can go. The magnitude of the destruction means there may not be sufficient septic and other infrastructure to support the trailers in Paradise. In the meantime, MacKell said temporary centers will likely remain in place in Chico and surrounding areas. Strain on first responders, volunteers and fire fighters is increasing across the state. Pamela Harris is in her 17th year of working as a Red Cross public affairs official. She arrived at the Camp Fire, her 37th deployment, immediately after helping with disaster relief for Hurricanes Florence and Michael and noted the exponential increase in disasters nationally. Red Cross officials and Cal Fire representatives maintain a practiced calm in the face of historic destruction. But residents worry it’s only a matter of time until we won’t have the resources we need to address the fires. For the Camp Fire alone, 5,615 fire personnel are battling the blaze, with crews in town from as far as South Dakota. Evidence of the destruction caused by the Camp Fire in Paradise, California. Photo courtesy of Bill Husa. “We’ve found in the last four or five years, the season of fires, which we used to call fire season — which I strongly suspect is becoming an outdated term — is year-long,” said Todd Durham, an incident commander assigned to a unit responding to the Camp Fire. The Camp Fire’s cause remains under investigation, but, as with most recent wildfires, many point to a combination of changing climate and unmaintained power lines. 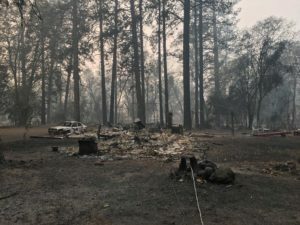 Victims of the Camp Fire filed a lawsuit against Pacific Gas & Electric (PG&E) on Nov. 13, alleging the utility company caused the fire by failing to adequately maintain its infrastructure in the area. This follows Cal Fire finding PG&E at fault for at least a dozen wildfires last year, strengthening public opinion of the company playing a significant role in the intensifying fire seasons. For now, the cause of the Camp Fire remains under investigation. Regardless of its start, bone-dry surroundings allowed for the Camp Fire’s rapid growth. It’s been 213 days without more than one-half inch of rain in Paradise. In the summer and early fall, the area received one-seventh of an inch of rain. That’s a fraction of the five-inch average. Dry conditions are prime for fires, and parched ground and premium fire fuel extend past Butte County lines. Two other fires rage in Southern California, propelled by intense gusts of wind. With fire damage on an upward trajectory every year and no substantial efforts to offset climate change, it’s difficult to comprehend what the future of California holds. As for Paradise, some intend to permanently leave the area and others already have, but many others remain steadfast in their commitment to rebuilding. Communities in my area are used to standing up again and holding each other tight. This fire is no different. Banner photo courtesy of Bill Husa.